Hi, I am Avinash Meetoo and I am happy to welcome you here. I am married to Christina and we have two wonderful kids, Kyan & Anya. In case you are wondering, Noulakaz means “our home” in my native language, créole. I’ve been blogging since March 2004. 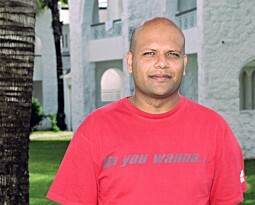 I am the Director of Knowledge Seven, a Linux, Mobile and Web Agency in Mauritius. I am a Computer Scientist and also an amateur photographer and musician. I use a OnePlus 3T smartphone, a Google Nexus 7 tablet, Fedora and CentOS Linux desktops and servers, an Apple iMac and a MacBook Pro and a lot of open source software. I am well known in geekland as the founder of the Linux User Group of Mauritius. Consequently, I am regularly invited to participate in Linux-related activities in Mauritius where people expect me to give presentations and lectures… Find my presentations in OpenOffice.org Impress and/or Open Document format here. I am a Red Hat Certified Engineer (RHCE). Have fun reading my weblog! The privacy of visitors to noulakaz.net is important to me.